Whether you’re showing smartphone, webcam, interviews, or animated backgrounds, video is a great way to enhance your content and engage learners. 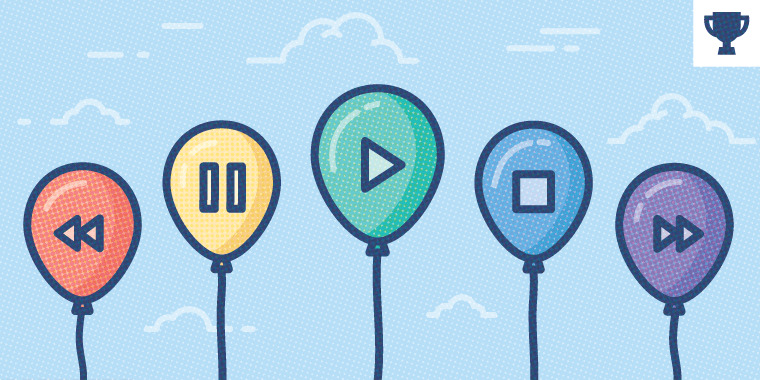 In this week’s challenge, we’ll look at creative ways for presenting one or more videos in your e-learning projects. First, let’s take a look at a few examples shared in the community. Here's a simple media gallery designed in portrait mode to showcase a series of videos. This media gallery player features scrolling thumbnails combined with drag-and-drop to play a series of video. Visual feedback is provided after each video is viewed. Here’s another idea for using drag-and-drop to load and play tutorial videos. Here’s another idea for using drag-and-drop to load and play tutorial videos. This interaction features a thumbnail preview and description after each item is dropped on the loader. This flat and elegant video player uses a tabs-style menu to load and play videos. You can download the source file from this community discussion. 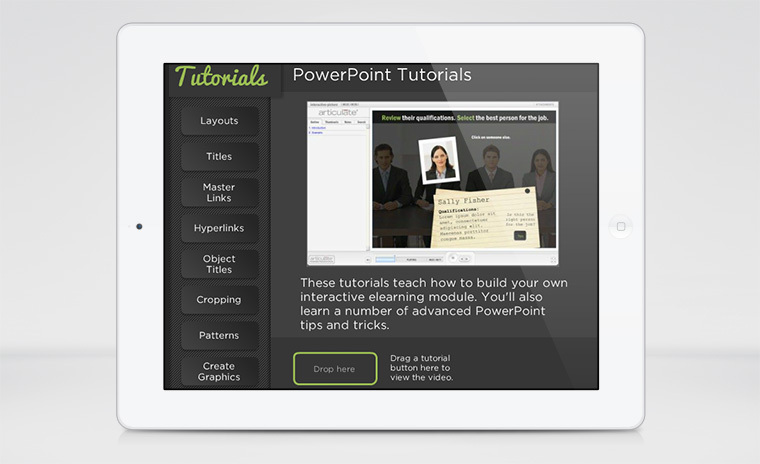 This week, your challenge is to share an interaction for presenting videos in e-learning courses. 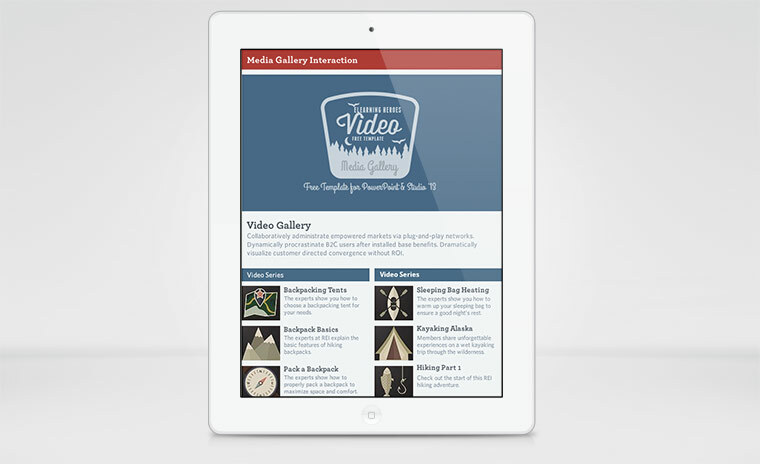 Your entry can feature multiple videos using a gallery layout or it can be used to present a single video. Wishing you a video-tastic week, E-Learning Heroes! First challenge of the year - looks like fun! I remember this one Montse, really nice example. Thank you, Linda! Oldie but goodie! I really like the hover effects Montse, great design. I like what you did there with the Storyline question ;) Nice work! I like being able to toggle between videos. This is a great concept Bob - love the video toggle - and I am happy to say that I got the answers right the first time. I really like this video gallery design - it flows really well. Tree-mendous job! Thanks for sharing. I understand sometimes we can't or don't want to go the full distance, but different videos even for this challenge would have been easier to notice that I was looking at a different one when selecting the > arrow. Hey, nice layout anyway Phil! That's a beautiful player Phil! This is neat Michael. I can thing of a lot of things I could do with this. I love the moveable panel. This is something I have been asking for in Storyline. I would like the ability to resize and move the lightbox. Pretty creative idea and presentation Brandon. Nice Brandon. I like how you showed the sky and clouds and music on the home page which we had to go back to each time to select another destination. Very nice Brandon, and yes: everyone should come visit Australia! Nice Nancy, it loaded quickly for me. Liked the pause and play buttons (icons). Loaded quickly for me. Liked the design too, Nancy! Loaded super fast for me too; looks amazing and works super well. Why is this your last challenge Nancy, if you don't mind my asking? Thanks for asking Veronica and Chris. I should rephrase - it will be my last challenge for a while. With my workload I am spending too much time on my computer. I want to try and cut down on the non-work usage. I need a break from the screen although I am addicted to it and the challenges so we shall see. It took maybe 6 seconds to load for me. I like the design. Why is this your last ELC? Very nice Alex! Thanks for sharing. Liked the three slider buttons on the bottom and how they are framed each time you slide them. Alexander, I just wanted to ask what the purpose of the Autoplay was. I'm not sure I used it properly. Happy New Year Alexander! and belated congratulations on completing all challenges last year :) Really liked the design of this, well done. I have the same question as Daniela re: the Autoplay button though? Here's to another great year! This is a neat idea Dianne, it's a great way to show your work. This is a great way to display your work, nicely done. That looks very professional Diane! This is a really nice design Linda - I love your choice of music too! I like the concept very much, Linda. That's fun! Coin interaction is an excellent touch. Great tunes! Knocked it out of the park, again, Linda! Not only did I like the idea of a jukebox (perfect to show videos and play the music), I couldn't help but listen to each song right to the end. Awesome! Another amazing entry Linda, fantastic! I love the idea of your video jukebox and it's built really well. Having to pick up your coin and pay to start is wonderful. Great concept and product from start to finish! Thanks so much Veronica & Tyler! Here's my attempt at the challenge. https://googledrive.com/host/0B8NHHWkmIPE6QzdqZHlBR09NRVU/ My blog post is located here: https://mlisterconsulting.wordpress.com/2016/01/11/e-learning-heroes-challenge-112-video-and-media-players/ The only issue that I am having is stopping the video from playing on the base layer when I switch to a new layer before the video finishes playing. I have moved the video to its own layer for now and that seems to work but there must be a trigger I can add which fixes this problem. The videos are YouTube videos embedded as web objects. Any feedback on the design or how to solve my problem would be appreciated. There's an option on the layer slide properties that lets you "pause timeline of base layer" Meaghan - this should work for anything that's on the base layer, although with this design do you need a video on the base layer? I really like your design and what you've done utilising existing YouTube videos. Thanks Dianne. I will experiment with the pause trigger although yes it probably isn't necessary to have a video on the base layer. Nice, Meaghan. What if you set it so the videos start automatically when you click on the tabs. What a nice idea Meaghan, looks great! Thanks Veronica. I built it so that the movie theatre background could be quickly swapped out with a training room or a classroom background for a different look and feel. Great to know, thanks Melissa. Thanks Melissa. I just started using Sublime Text Editor for my Web Developer course and just today added a video. That is so helpful Mel, thanks for sharing. Cool Melissa! I did something similar the last weeks but it is a bit more complicated because it uses HTML, CSS and JS and two different Video files (mp4 and WebM) --> i like your CSS version, it is much shorter. I think I will post my version anyway and mention yours :). My word, you are a genius! This looks great, Amar! The animations and videos are seamless. Beautifully done! Nice approach Amar, stunning as well. Clever use of the slider for the video travelogue! And lots of fun videos!! turtles? Thanks, Sharon! Yes - turtles! We'd just climbed down from the rock tombs and the guy running the cafe at the bottom saw how much we loved his cat, so he brought out his pet turtles to keep us company, too. Very nice Jackie, love the slider navigation. That's a great slider Jackie. Thank you, Joanna! Yes, I thought the colors and labels would make it easier and more intuitive to navigate. Very nice! Jackie, your designs never disappoint! Thanks for bringing us along on your trip. I felt like I was packed right in your suitcase! I really like the use of the slider - great idea! I have many mentors in this community and you are definitely one of them Jackie. Loved this. So clean and inviting. Liked the clean layout and size of the video. Awesome! I hope to do this during my trip to Italy this summer! What kind of camera did you use? Thanks, Daniela! Italy would be a phenomenal subject. I used a Panasonic Lumix DMC-ZS40 - usually just for still shots - but it does well with video, too. If I'd actually been trying I'm sure these clips would have come out much better. :) Have fun planning your trip! Beautiful work Jackie, loved the turtles! Love this Jackie - I became totally mesmerised with the footage on Dondurma - the ice-cream hand-over when I know I should have been focussing on your design! Well done and thanks for taking us to Turkey with you! Haaaa :) Thanks, Dianne! Those ice cream guys are pretty funny and Dan loves playing along and happily consuming the result. You always do a great job of taking us along on your amazing travel adventures too! Jackie, this is awesome! Perfect use of sliders thanks for the inspiration! Looks great, Michael! Works beautifully. Fantastic Michael. The music was a good choice. 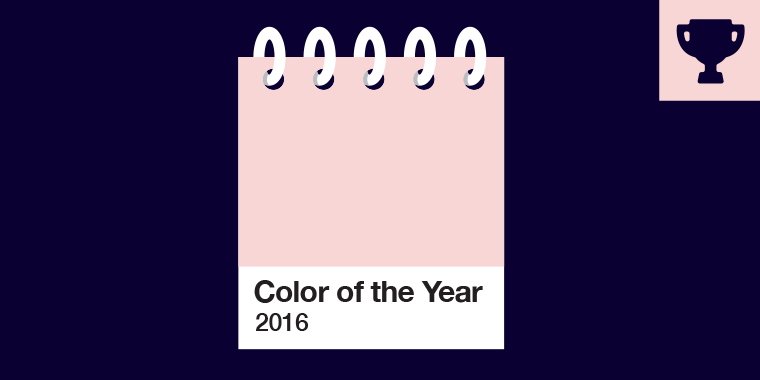 How did you match the two years? Really liked watching it. I was in awe looking back and forward in time ! Thanks Daniela. Actually, the music and the two side-by-side 'movies' were part of the original video, see here: https://vimeo.com/105279963 I just split it into two, imported them into SL and added the triggers, motion path animations and slider 'glue'. Lovely layout Emma. The videos didn't play for me, I'm not sure if you inserted them, or if this is just a template with a placeholder for video. Hi Emma! As Linda mentioned, it looks beautiful and I can hear the intro music - but I can't see any videos. Is it just meant to be a placeholder? Thank you both for the comments. Actually, I was wondering how it showed to you all... I've been struggling with YouTube embedded WebObjects. For some reason when I play it I have to authorize my browser to allow insecure content and then it shows the videos. Is there a way to prevent this within Storyline? Thanks in advance! You can use https in your embed code instead of http and that should fix that problem for you. Very clean, Emma. Just need the videos now. Great idea David, the camera feed is a nice touch. Great idea with the live video camera, David. Thanks for the feedback, Linda and Joanna. Were I to build this out, I would probably add a couple of other "live" spots within the live feed screen (in thumbnail view) that the viewer could click on to view a different location. That's a really nice piece David, the look and feel is very cohesive, works great too. I'm very new to Storyline (just started a couple of hours ago :)) but I figured out it won't hurt to participate. I used the awesome Melissa's tutorial for the background: https://www.linkedin.com/pulse/how-create-full-screen-video-background-your-next-10-milloway-msit. Here is the link https://googledrive.com/host/0B5Z_Eg6DnIzuTlBoVE8wZG1VLVk Would you please advise me how do I stop video (it's youtube, embedded via "web object" from playing when switching between layers? I apologize for the question, probably stupid for most of you. I had the same problem. There is a pause trigger you can use but what I did was I simply pulled my videos off of the base layer and put them only in layers. This worked for me. Nice work, Elena! I really like what you did with the background :) If you access the Slide Layer Properties, you have the option to Hide other Slide Layers. I think this would fix that issue? I could be misunderstanding the problem though... Welcome to Storyline and the challenges! Wow Elena! This is your first Storyline project?! So good, well done! Nice Elena! There was a pause button at the bottom left of the video. I was able to pause it and then click on the other videos. Thanks Alexander! Creating a simulation with "retro technology" was a lot of fun. Maybe I'll make a record player sometime! Snellevision! Great idea, Peter. I miss VHS players sometimes. I'm glad that didn't go unnoticed! It's a little cheesy, but definitely my sense of humor. Thanks for your feedback, Joanna! Hi peter, Nice setup and good idea. Clever interaction Peter, love the sound effects. Thanks Linda! I really appreciate your feedback. OMG Peter, I'd forgotten about having to rewind the videos before returning! That's a great interaction! So creative. Miss the sound of the VHS entering the VCR. Liked that I could choose a video. Awesome Peter! Can we do a David Bowie challenge next week? Suuuuch a great idea, Nancy! If he wasn't all about creativity and innovation I don't know who is. Great idea! I almost used his videos for this week's challenge. Really nice example Joanne. Beautiful layout and cute baby videos. Thank you, Linda and Peter. I am glad you like it. Great thumbnails, I like this! Liked the filmstrip layout and definitely liked the actor! Nice Joanne! Very nice Joanne - cute subject for your videos. I'd never thought of adding an animation to a slide that you lightbox before - nice effect though! Looks great! I love the fly-in animation on the lightboxes! Hey Ashi, Its a nice interface and also your idea is good, but i think things get stucked somewhere. When I dragged the tape over the disc player the video start playing but when I clicked on the video it paused but sound continue to play. Great minds think alike! I did a similar one with VHS, but yours is more technologically advanced :) Fun interaction - nice job! Hola Ashi, I love to see your stuff! I have a suggestion to make even more Ashisome! What about adding a "drag over" state so the tape flips horizontal when dragged to the deck? Anyway, a pretty amazing sample. Does that mean I'm hero-like? Our telepathic forces align! You are hero like Alex for sure. Very nice, Kartik. I like how I don't need to stop an existing video before playing another. And those are some nice shots! Very nice layout and functionality. Effective and intuitive design. Thanks Montse for your valuable comment.